VetPhysio is led by Elizabeth Jones (nee Pigot) a Chartered human physiotherapist and veterinary physiotherapist. Lizzie is a fully registered ACPAT physiotherapist. Animal physiotherapy and rehabilitation is provided on a home visit basis for large and small animals with referral from your veterinary surgeon. 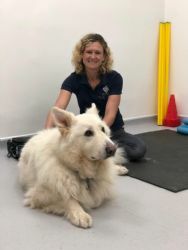 Cats and dogs can also been seen in the brand new rehabilitation centre at Southfields Veterinary Surgery in Dorchester where Lizzie heads up the rehabilitation service. 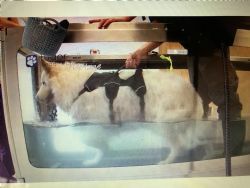 Southfields has state of the art facilities and a underwater treadmill for hydrotherapy. Human physiotherapy and Pilates is provided on a home visit basis. Group Pilates classes are run at Bere Regis Village hall (see Pilates link above for more details). Lizzie is based near Wareham, Dorset. Physiotherapy provided on a domiciliary basis is available throughout Hampshire and Dorset. Areas covered include Dorchester, Wareham, Swanage, Purbecks, Poole, Bournemouth, Christchurch, New Forest, Ringwood, Wimborne and Blandford Forum. Physiotherapy is an evidence based health profession concerned with the assessment and treatment of disability. How do I know if my animal needs physiotherapy? Animals can communicate with us if they are in pain, here are a few signs you can look for. Pain in dogs may be presented as lameness, licking a limb, an arched back, unwillingness to go on walks or altered behaviours such as no longer wanting to jump into the car or go up stairs; avoiding or being aggressive towards other dogs. In horses schooling problems, behavioural problems or reduced performance can all be caused by pain, muscle weakness or joint stiffness. Animals, like people respond well to physiotherapy techniques and modalities. Physiotherapy intervention can limit the impact of injury and disease processes, optimize healing potential and accelerate return to function and/or performance. Lizzie heads up the rehabilitation team at Southfields vets working alongside Caroline Drysdale the hydrotherapist .